Tool to generate barcodes. Barcodes are a representation of data in a graphic form (with bars), for automatic reading by a machine and can be designed using this generator. Team dCode likes feedback and relevant comments; to get an answer give an email (not published). 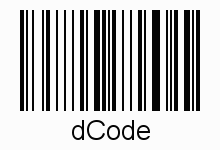 It is thanks to you that dCode has the best Barcode Generator tool. Thank you. > [News]: Discover the next version of dCode Barcode Generator! How to decrypt a barcode? To decode a barcode, the easiest way is the smartphone: install an app like Google Goggles or Barcode Scanner here. Barcodes are standardized lines of vertical bars, the generator only follow the instructions of each norm. A barcode is usually made up of a code signaling the beginning, then the data, then a checksum to verify the integrity of the data read, and finally a code signaling the end of the barcode. How to display a text label under the barcode? Bar codes are usually accompanied by a text repeating their value for a non-automated reading (by humans). It is possible to write another custom value with dCode. Preserve the dimensions of the original label for a better rendering. How to get the country of a product using its barcode? Improve the Barcode Generator page!